If you live in a city like New York or Chicago, you’re probably well accustomed to rats and rodents by now. Scurring on the streets or in the subway track, by now you’re used to these rodents. But if you see a rat in your home, that’s a completely different problem. To learn more about the different types of rats, keep reading. There are actually more than 50 subspecies of rats, and each one has it’s own behavior traits, appearance, location, diet, and carry different diseases. Knowing these types can help you figure out what kind of rat is in your home and how you can get rid of it. If you live in North America, the most common rats are ship rats, Norway rats, marsh rice rats, and woodrats. Here’s how you can tell them apart. Norway rats or brown rats have coarse brown or dark grey fur, with a lighter underpart. These are large rats and can weigh twice as much as a black rat, and much more than a house mouse. Norway rats can be about eight to ten inches long, with a seven to ten-inch tail, and weigh between nine and twelve ounces. These rats can adapt to any climate or temperature. Norway rats build nests or burrows to stay warm. These rats can also swim, so you may see them near a lake or backyard pool. They can eat anything including small birds and eggs, to small invertebrates, food scraps, and plants. Brown rats can carry a lot of different diseases like Weil’s disease, cryptosporidiosis, Q fever, rat bite fever, viral hemorrhagic fever, and hantavirus pulmonary syndrome. 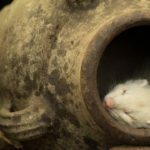 These rats can also carry a parasite that causes toxoplasmosis, which can be spread from rats to humans if a house cat feeds on an infected brown rat. Ship rats are also known as black rats or roof rats, are about five to seven inches long with a six to nine-inch tail. These rodents weigh between 75 to 230 grams. Despite being called a black rat, these species have serval different colors ranging from black to light brown with a lighter underbelly. 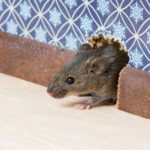 These rodents are the most likely to be in your home, and are found in every continent, but are the most common in tropical climates and coastal areas. They can eat small animals like birds, seeds, and fruit. If you have a pet, you might want to keep their food covered as ship rats will eat dog or cat food. In the 1920s in England, ship rats bred along domesticated brown rats, which made rats with a green tinted fur. You can tell black and brown rats apart because black rats are slightly smaller than brown or Norway rats. Ship rats are pests to farmers because they eat a range of crops. These rats can also carry pathogens like the bubonic plague, toxoplasmosis, typhus, trichinosis and Weil’s disease. There’s a theory that the displacement of black rats by brown rats led to the Black Death’s decline. A woodrat or packrat can weigh between 300 and 600 pounds and on average about 400 pounds. The Arizona woodrat is the smallest of this species and can weigh less than 132 grams with a body of 15 centimeters. Woodrats are found all over North America and can survive in the Arctic of Canada to the deserts of the southwest. Woodrats location will determine how large they grow. For example, woodrats from the dessert have a bushy tail and are larger than woodrats in the mountains. Woodrats have a diet of seeds, insects, nuts, leaves, and even small mammals. Woodrats have a tail that is dense but isn’t bushy, with large eyes and white feet. Its fur is soft, long and thick and can range from grey to reddish brown, with a white or rust color on its underbelly. Woodrats can carry the Arenavirus, which is transmitted through the air where woodrats feces and urine are. These rats carry another airborne virus called the Hantavirus which can be fatal. Woodrats can also spread Typhoid, Weil’s disease, salmonella, parasites, Bubonic plague, and Trichinosis. This medium size rat can look like black and brown rats. The way to tell the difference is there is more of a contrast in color from the marsh rice rats bodies, heads, and stomachs. Marsh rice rats have thick short fur, with gray to grayish brown upperparts, small cheek pouches, and ears with light hair. Marsh rice rats are smaller than other rats, with a total length of 12 inches or less. Marsh rice rats can live in the East Coast, to Texas and even South America. These rats like wet, marshy areas like near lakes and oceans. 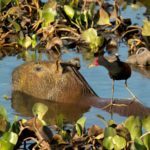 Marsh rice rats have a diet of green vegetation, rice, insects, fungus, snails, small fish, marsh grasses, and even fiddler crabs. These rats can carry the Bayous virus which can lead to hantavirus infections. Marsh rice rats can also carry Lyme disease and Bartonella. There are many ways to get rid of rats in your home. The most common is a traditional snap and glue trap. This can be time-consuming as you’ll have to constantly set bait, reset the traps, and even discard of the trapped rat. Now that you know what to look out for, isn’t it time you exterminate the rat in your home? All of these common types of rats have one big thing in common: they all carry diseases and are pests. If you have a rat in your home, you need to get rid of it ASAP. For more information on pest control and how to get rid of the unwanted rodent in your home, check out our website.